Almost all of us have interacted with ice in some way, even if it is simply clinking around in your glass. But have you ever taken a look at those ice cubes as they float? 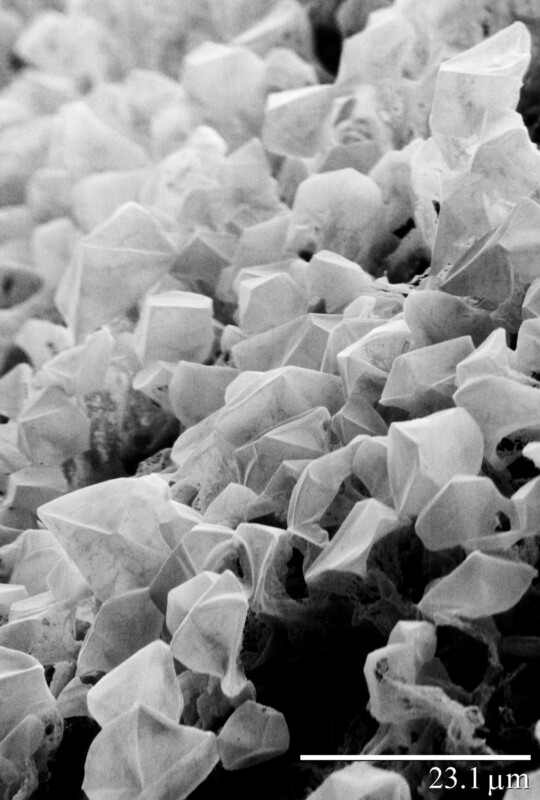 Have you ever wondered what is going on at the microscopic scale in those little cubes who sacrifice themselves to keep your beverage so deliciously cool? (Okay – so the last question may imply a high level of nerdiness, but still…) Most of us are so accustomed to the presence of ice in our daily lives that we scarcely give it a second thought, but an important aspect of my research is looking at ice. And not just giving it a casual glance, but looking at it for hours under incredibly powerful microscopes! For those of you who hardly pay your ice cube a second thought, here are some photos to help you appreciate the more photogenic side of those little crystals. 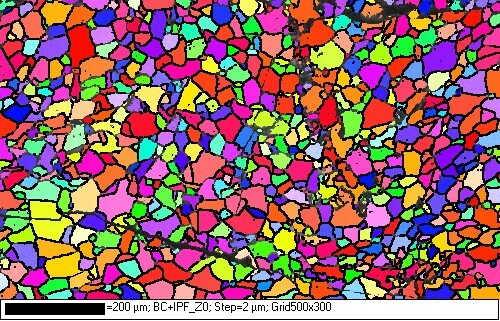 A crystal orientation map from one of my experimental samples. Basically, the colors correspond to different tilt angles, while the solid black lines define the edges of individual crystals. 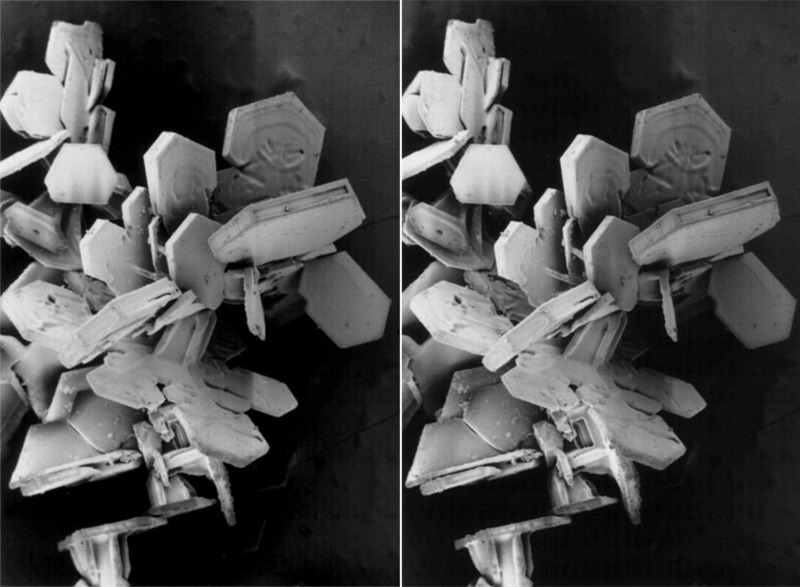 A snow crystal photographed in a regular light (left) and in a low-temperature electron microscope (right) by the USDA’s snow research group. 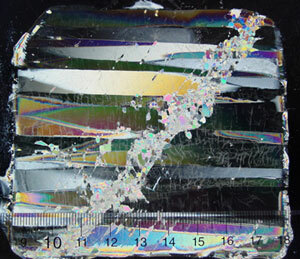 “Columnar” ice, similar to sea ice, that has been deformed experimentally. Photo credit Narayana Golding. FROST ON MARS – or what it might look like, anyway. 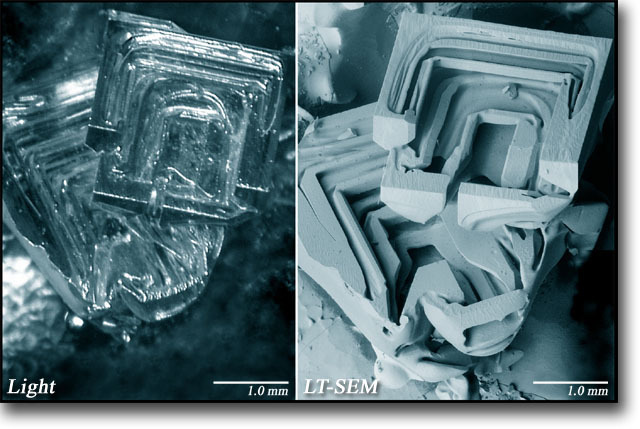 On Mars, the atmosphere can get so cold that not only water freezes, but carbon dioxide… this is crystalline CO2, courtesy of the USDA. Frozen CO2, or “dry ice” is used to package frozen foods (and, incidentally, to package my ice samples during formation)! Found it! I just spent about 10 mins trying to get the stereo image to work to no avail whatsoever.